Behaviour experts around the globe promote enrichment through foraging as an excellent way to ensure a mentally and physically healthy parrot. The reason? When companion parrots are given the opportunity to "work" for their food - as they would if they were in the wild - many problematic issues can be avoided. Boredom in companion parrots can often be linked to behavioural issues, from excessive screaming to feather picking, and beyond. Providing parrots with enrichment opportunities that sustain activity can be an ongoing challenge, and the novice often does not know where to begin. The many wonderful toys available in stores can be very enjoyable for parrots, but also can be expensive to invest in for the average caregiver. The good news is that creating foraging opportunities for your feathered friends doesn't always have to be expensive, or even difficult. 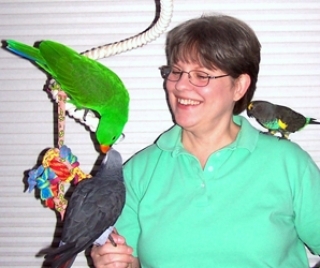 Kris Porter joins us today to share her ideas to inspire all caregivers looking for ways to enrich their companion parrot environments.